Both the igGrid and igHierarchicalGrid controls feature tooltips in the grid. Tooltips appear when the user hovers the mouse pointer over a grid cell and are configurable to adjust duration and visibility options. Further information regarding the classes, options, events, methods and themes of this API are available under the associated tabs above. A list of custom column settings that specify custom tooltip settings for a specific column (whether tooltips are enabled / disabled). Enables / disables tooltips on the specified column. By default tooltips are displayed for each column. Note: This option is mandatory. Either key or index must be set in every column setting. Specifies the maximum width (in pixels) of the tooltip when shown for the specified column. If unset the width of the column will be used instead. Sets the left position of the tooltip relative to the mouse cursor. Sets the top position of the tooltip relative to the mouse cursor. Sets the time tooltip fades in and out when showing/hiding. cursor gets outside of the cell. mouse cursor is hovered over a cell. controls the tooltip's style . The tooltip will be positioned according to the mouse cursor. Will render the tooltip content as plain text. 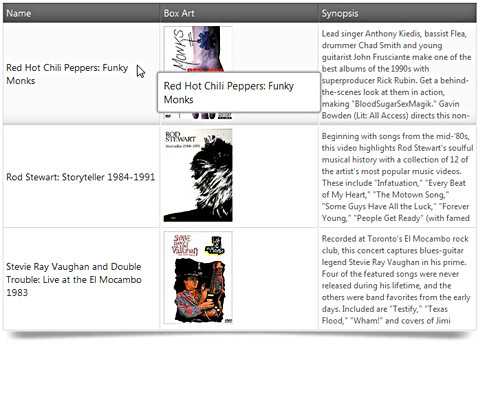 The tooltip will be positioned according to the target element with an arrow pointing the element. This style is more suitable for touch-supported environments. Will render the tooltip content as HTML. determines the tooltip visibility option . tooltips always show for hovered elements. tooltips do not show automatically. tooltips show only when the underlying data overflows its container. use args.columnIndex to get the column index of the cell the tooltip was displayed for. use args.columnIndex to get the column index of the cell the tooltip is displayed for. Returns the ID of the parent div element bounding the ruler and the tooltip container. Classes applied to the tooltip widget. Classes applied to the tooltip container.